Christmas this year didn’t turn out quite as expected. Clive, not confident that he’d behaved well enough to receive a visit from Santa, decided to buy himself an early present and consequently disappeared with it for the entire week before Christmas. With only the occasional sighting of a Clive shaped silhouette wandering the far edges of the fields that surround the village, with what looked like a transistor radio, gossip and conspiracy theories reached epidemic proportions. Come Christmas morning however, theorising over Clive’s activities came to an abrupt halt as power failures throughout the village gave way to an entirely new subject of communal gossip. By the time I surfaced at 7.30am, a throng of mice were steadily assembling on the green, frantically sharing stories of electrical appliances failing to switch on, gas ovens with no ignition, zero internet connection and telephones devoid of a dial tone. It would seem that somehow the power lines had gone down overnight and by the time I rocked up to the party, coffee in paw, at 8.00am the agreed general consensus was that Santa with his overburdened sleigh was to blame. 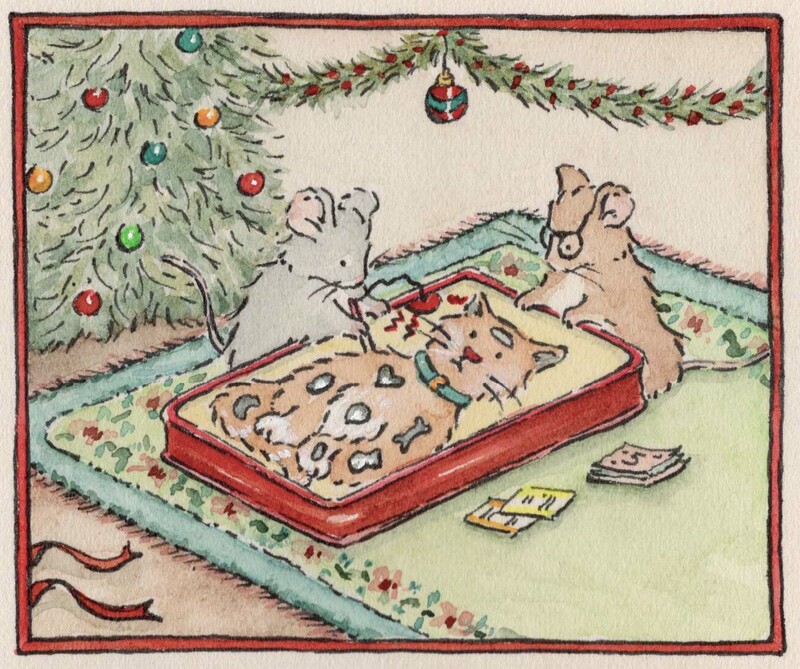 Faced with the prospect of uncooked Christmas dinners in cold dark houses it was looking to be one of the most miserable Christmases ever, that is, until Millie and Gertrude appeared from behind the neatly clipped privet hedges of No. 32 with a substantial wad of notepads and modest army of pigeons. 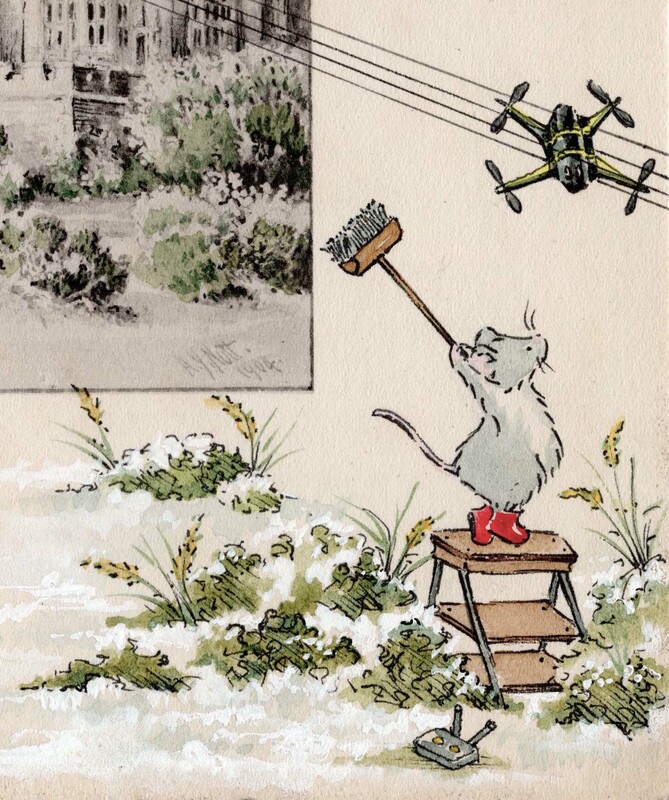 Within no time mice were steadily leaving the green with individual slips of paper detailing what they were to collect and bring to the church hall, for this, Millie and Gertrude had astutely realised, was the only building in the village that housed its own generator. Within the hour, all manner of items were making their way down to the hall via a line of industrious villagers. Winston fired up the generator whilst Maureen organised a team of vegetable ‘prepers’ in the amply sized kitchens. Betty set about sorting a dining area at one end of the hall whilst Gertrude got to work arranging sofas, lamps, rugs and a television on which to watch the Queen’s Speech in an after dinner lounge area at the other. Millie put me in charge of pigeons, our job being to courier vital messages back and forth around the village in the absence of any telecommunications. I’m pleased to report that Christmas dinner was a resounding success, but after a few rounds of after dinner ‘Operation’ and numerous searches for the plastic fur-ball which, we concluded, was the trickiest piece in the game, Winston and I felt ourselves drifting into simultaneous food comas, so decided to take the sled out for a run around the grounds of the castle. Four hedgerows and a good few sprout fuelled gaseous expulsions later, we came across Clive wobbling precariously atop of his kitchen steps in a pair of rubber Wellington boots, seemingly trying to whack what looked like a large bumble bee out of the power lines. Concerned for his safety, Winston enquired as to whether there might be a better solution, but Clive, although admitting that he’d been ‘at it’ since before dawn, assured us that he’d already used the same technique to bash the bumble out of the phone lines with considerable success. Rapidly coming to the conclusion that it was in fact Clive and his yard broom, and not Santa, that had plunged us all into the dark ages for Christmas, we agreed to keep schtum on the proviso that Clive gave us a go of his new toy and Winston be able to borrow it for a week in order to study its internal circuitry. And so, the blame for ‘The Great Blackout of Christmas 2018’ will forever hence be laid firmly at the boots of Father Christmas who, due to his unique job title, will be forgiven far more quickly than Clive. Clive’s story remains little more than spending a week trying to get a good signal on his new transistor radio, whilst his drone remains hidden away until mid January when it will resurface as a late Christmas present from his forgetful Great Aunt in the Outer Hebrides. I dread to think what other chaos he caused during the week before Christmas, I guess we’ll never know! Morris would like to wish all of his followers the happiest and healthiest of New Years. He hopes that your Christmases weren’t quite as disaster struck as his, but if you’ve got any cracking Christmas disasters that will give him a good laugh, please feel free drop Morris a line under his Instagram, Facebook or Twitter shares. Previous 70 – Naked flames prohibited due to risk of drowning!